This is the seventh report on sizing trends in PCs below 12 inch screen size (and above 5 inch) appearing in the German market through the popular price comparison engine, Geizhals.at (*1) The last one was done in Feb 2011. Once again we’ve seen a big jump in overall numbers. The 7″ segment and 10″ segment have grown while the 11″ segment has shrunk. The 10″ market dominates more in this report than it did in the report of Feb 2011 although there is a clear trend occurring in the 7″ space where growth in products has occurred in all of the last 4 reports. The number of choices in the mobile screen space (above smartphones) has grown over 2x from approx 240 SKUs to over 630 SKUs. The big jump in numbers is clear to see from the top graph. Total numbers jumped by 115 with most of that growth coming from the tablet form factor and the 10″ netbook/notebook sector. Big increases in the 7″ tablet sector (now the biggest number so far) and a reduction in the numbers of 11″ devices mean that percentage distribution has changed a lot. 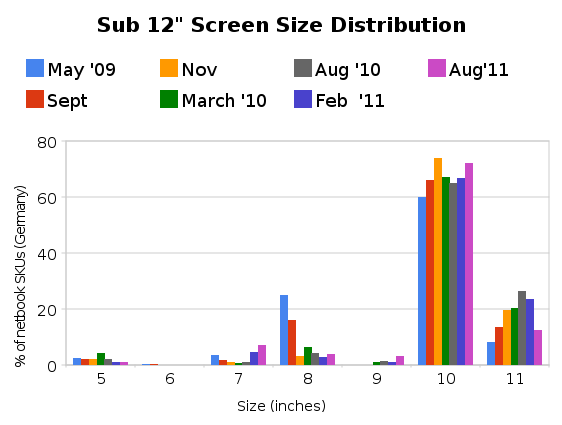 The iPad2 introduction caused the growth in the 9″ segment. In the 10″ netbook space which accounts for 75% of the 10″ category there are now 18 AMD C-Series SKUs and 315 Atom SKUs. 64 of the Atom-based devices (20%) use the high-end N570 version. In interesting statistic is that 1 in 5 devices on the market in the 5-11″ segment are from ASUS. Across all categories, ARM-based CPU designs account for 23% of all devices, almost exclusively in the tablet sector. It will be interesting to see how that changes over the next 2 years with the introduction of Windows for the ARM processor. In terms of weight, the tablets mean that the average weight of a device has gone down. 28% of the devices weigh under 1KG. Meego appears for the first time along with the cheapest and lightest netbook ever launched. The ASUS Eee PC X101. Sandy Bridge (2nd Generation Intel Core CPUs) enters the sector with 14 SKUs from 5 devices. In terms of netbook trends, the search and news volumes seem to be steady after their large drop in Q1 (see Google Trends.) Numbers of devices in the market have increased and obviously the introduction of Cedar Trail in Q4 will create news, products and searches in the netbook category. The trend for netbook products, news and search is going to be level-to-rising for Q4 That may, or may not, relate to sales numbers. In terms of handheld PCs, our focus here at UMPCPortal, it’s a sad story. The online market is now almost totally clear of 5-9″ X86-based Windows devices. 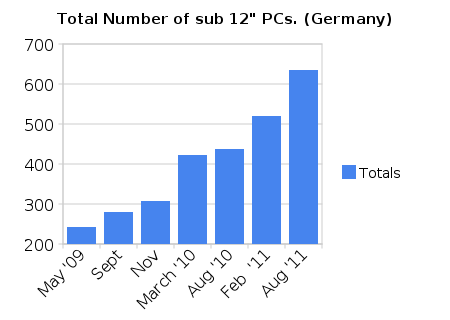 It will be interesting to see how the Windows 8 market affects this in 2012. Warning: Please remember that this is a single data-source analysis of what is happenning today, in the German market. This is not a complete market analysis report. You may use the data and images but please also reference this article which includes this warning. *1 Based on SKUs, not model families. Data taken from Geizhals An English language (and UK market) version of Geizhals is available at Skinflint. 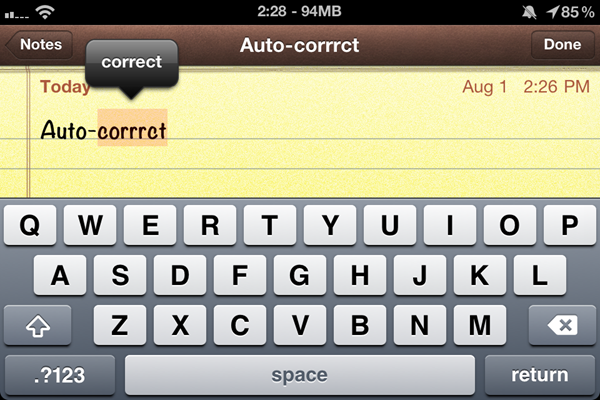 Why Donâ€™t We Have Auto-correct on Windows? This has been bugging me for a long time: if any Android/WP7/iOS/etc. device out there is smart enough to change â€œim inch to â€œI’m inch or â€œtheres inch to â€œthere’s inch, why don’t we enjoy the same time- and keystroke-saving measures on Windows? Update: As pointed out in the comments, OSX has had unified spelling correction since Snow Leopard, and has just added iOS-like auto-corrections with Lion. Windows is sorely lacking these features! Does Linux has something similar? It really amazes me that, in some cases, we’ve got better text input features on low-powered smartphones than we do on ridiculously high-powered Windows machines. The old guys have something to learn from the young’ins. Sure, a select few Windows programs might give you that squiggly line underneath a word that you’ve spelled wrong, but it isn’t system-wide, doesn’t learn automatically, and is probably rarely updated to add new terms. The few desktop programs that do make an effort to assist your typing often do an inferior job. In iOS, if I misspell a word, the phone knows how look at my typing pattern and if its relatively certain that I meant â€œpants inch instead of â€œpsnts inch (because A is near S and there’s a high likelihood that I hit the wrong key), then it will automatically make that fix for me. If it isn’t so certain, it’ll give me the squiggly line upon which I can tap to see a few suggestions about what I might have meant. It also highlights the word in question when I tap on it so that if the word is not any of the suggestions, a single press of the delete key will remove the word entirely so that I can try again, rather than having to spam the delete key until I get to the start of the word. Smartphones also have access to the names of all of our contacts, so they can auto-correct and suggest those, instead of putting a squiggly line under our good friend’s name and trying to tell us that we spelled it wrong, as would happen in your average Windows word processor. Let’s not forget that smartphones are also better learners. They know how to pick up words that you commonly use even if they aren’t already in their dictionary. Once added, the term is added to the system-wide dictionary. On a Windows program, you’d not only have to manually add a term, but it’s on a per-application basis (that is, if that program supports a custom dictionary). I have to type the word â€œresolution inch all the time for my writing here on Carrypad and in other places, but it commonly comes out as â€œresoultion inch simply because of the way my fingers sometimes get ahead of themselves. It would be so easy for a computer to realize what I meant and make the fix for me, and yet here I am, having to make the correction manually every time on Windows. You might say that we don’t need auto-correct when using full desktop keyboards, but I disagree. Though I’ve had a fair share of typing on hardware keyboards, I still occasionally hit a key next to the one that I intended. What’s more, in my daily perusal of the web, I see lots of people who would benefit from such typing assistance — I’m talking about those who don’t seem to know that punctuation exists. And I must ask: why manually insert punctuation and manually add terms to non-universal dictionaries if computers are easily smart enough to do it for us? That’s like manually keeping track of the time instead of using a clock. Why Don’t We Have Auto-correct on Windows? This has been bugging me for a long time: if any Android/WP7/iOS/etc. device out there is smart enough to change “im” to “I’m” or “theres” to “there’s”, why don’t we enjoy the same time- and keystroke-saving measures on Windows? Update: As pointed out in the comments, OSX has had unified spelling correction since Snow Leopard, and has just added iOS-like auto-corrections with Lion. Windows is sorely lacking these features! Does Linux has something similar? In iOS, if I misspell a word, the phone knows how look at my typing pattern and if its relatively certain that I meant “pants” instead of “psnts” (because A is near S and there’s a high likelihood that I hit the wrong key), then it will automatically make that fix for me. If it isn’t so certain, it’ll give me the squiggly line upon which I can tap to see a few suggestions about what I might have meant. It also highlights the word in question when I tap on it so that if the word is not any of the suggestions, a single press of the delete key will remove the word entirely so that I can try again, rather than having to spam the delete key until I get to the start of the word. I have to type the word “resolution” all the time for my writing here on Carrypad and in other places, but it commonly comes out as “resoultion” simply because of the way my fingers sometimes get ahead of themselves. It would be so easy for a computer to realize what I meant and make the fix for me, and yet here I am, having to make the correction manually every time on Windows. Another tablet in the mix! Multi-boot possibilities set this apart from the ARM-based tablets. 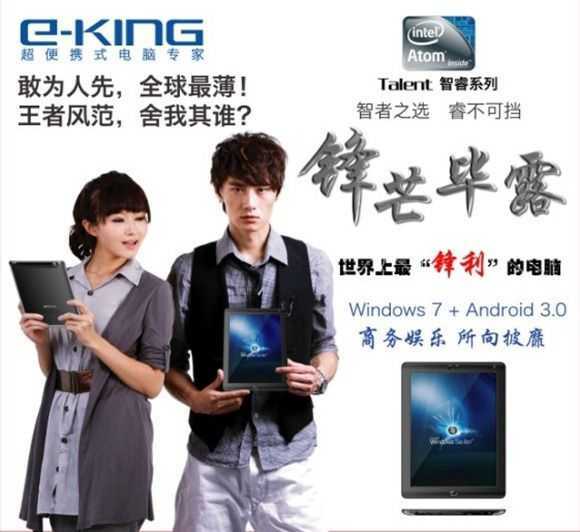 The E-king range of UMPCs, by the company that bought the rights to the extremely productive (but very ugly) Wibrain B1/i1 and the slider M5 ultra mobile PC will soon have a 10 inch tablet offering called the Talent T9. It’s built on Intel’s Oaktrail and is said to be ‘the thinnest’ in the world. Whatever, China! What we really need to see is the device in action. Specifications look OK with 2GB RAM, an impressive 650gm weight, an IPS screen and 3G options and there’s a big play on the multi-OS options that a traditional PC platform brings. It’s worth watching closely because Intel are working on Meego and Android official builds for this platform. The multi-OS claim is probably more important than thickness. Click here for our tracking page including specifications, gallery and news items. As for price and availability, we’re hearing about a September availability with some possible hands-on in August but as always, expect that to change. Pricing is completely unknown at the moment. The E-King Talent T9 goes up against a number of other 10 inch Oaktrail tablets including the Lenovo Ideapad P1, Viewsonic Viewpad 10 Pro and the Samsung Series 7 Slider which we could see launched at IFA in September. Here’s a list of all Oaktrail tablets. With respect to Meego and Android for Oaktrail, look forward to news of that from Intel’s developer forum, also in September. Update: We’ve had confirmation from Simon Thomas at Think4Mobile that this is real. They’re expecting a sample very soon.